I decided at the beginning of February to create a drawing a day. I put up a quick blog to post them. Then, I started playing with the blog template to see if I could get different layouts for the images. I have been wanting to create an online portfolio in WordPress that would work for artists, and this gave me a site to play with. 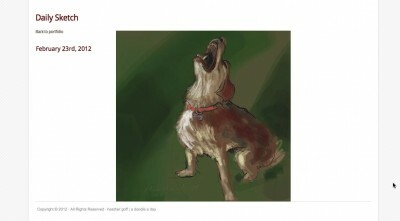 My “doodle a day” WordPress site has given me the perfect platform to develop custom WordPress portfolio layouts for artists. I am building on a theme created by Organic Themes. The theme already came with three portfolio page layouts, a one column, two column and three column layout, but I wanted to arrange the artwork in a more traditional arrangement. This morning I figured out how to use a jquery code that I found on codrops (view code here) and adapted it to work in WordPress. I am pulling the photos attached to posts of specific categories (passing the category parameter to the page) and ordering them randomly. When the page first loads, you get a grid of all the images in a specific post category. If you mouse over the thumbnails they highlight. And when you click on a thumbnail, it zooms larger, and you can paginate through them. I am very excited to have figured out how to adapt this code to work in WordPress. 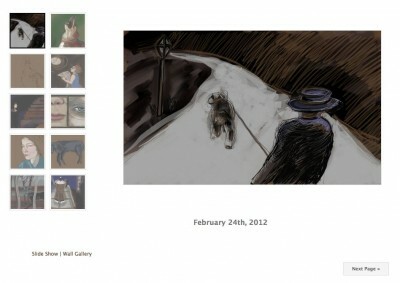 Here is the example of the image grid gallery on my “doodle a day” blog. First I had to figure out how to retrieve just the URL of the specific image size attached to a post. I used a variation on the code found here. Now I have three different custom layouts I’ve created for artists. This one I call the standard portfolio layout. I have the default category page displaying this way. 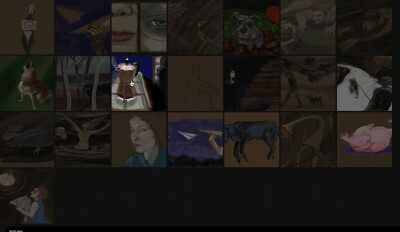 This standard art portfolio layout displays the number of posts you set in your reading settings in the dashboard. And then yesterday, I figured out how to pass the category parameter to a slide show page, that loops between the images and shows the title of the image. I modified the jquery code that I found here. Here is how the standard artist portfolio layout pulling from wordpress posts looks on the site. For other post categories, I need to create specific page templates that target them. For example, news, press, exhibitions. However this is fairly simple to do and can be customized for each artist depending upon their needs. Anyway, I’m having a lot of fun combining the drawing with the programming in this site. 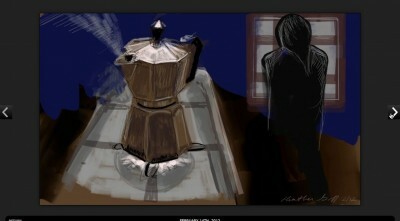 This entry was posted in artists, Blogging on February 25, 2012 by Heather Goff. 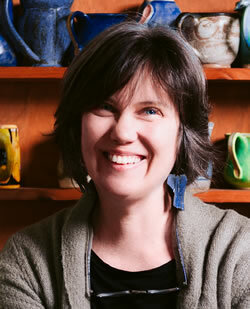 Heather Goff has been programming and designing websites since 1997. On this blog she posts tutorials and useful information gleaned from her day to day experiences that she hopes will help both her clients and her colleagues. If you are moving your website, be sure not to forget! Are you having trouble getting single line spacing in your blog? Some simple guidelines to make your blog look designed, without hiring a designer. copyright © 2019, heather goff, inc. all rights reserved.